Arizona Landlord Tenant Blog: How to create a "Landlord Friendly" residential rental agreement. How to create a "Landlord Friendly" residential rental agreement. (The following is an excerpt from the Arizona Landlord's Deskbook, Fifth Edition; footnotes and citations of law have been omitted). This article will tell you what MUST be included in an Arizona residential rental agreement, what CANNOT be included and my own recommendations about what SHOULD be included in every "Landlord Friendly" (i.e., most favorable to the landlord) residential rental agreement. A properly drawn rental agreement serves two purposes. First, it prevents litigation by clearly setting forth all the terms and conditions of tenancy. Normally, when a tenant has a grievance and then sees that the rental agreement that s/he signed clearly supports the position that the landlord is taking, s/he will mumble a few obscenities and then go away. Second, in the event the tenant does not go away, a well-drafted rental agreement ensures that a court of law will support the position that the landlord has taken. In which case, the tenant will pay court costs, mumble a few obscenities and then go away. In short, a well-drafted rental agreement prevents litigation and ensures success if litigation is inevitable. Few things the landlord does will be this rewarding. CAVEAT: success in litigation will only occur if the rental agreement says what you want it to say. If the rental agreement says "pets are allowed" and you don’t want pets, you will lose. I had originally intended to put a sample rental agreement in this book, but as soon as I contemplated the task of drafting one rental agreement that would suit all, or even most, landlords, the obvious became apparent – no single rental agreement will work for everyone. Sure, you can buy a dozen different residential lease and/or rental agreement forms from various stationery stores, but the truth is, none of them will fit your circumstances perfectly (and, more importantly, none of them comply with Arizona law; see Chapter 2, Section B(1)(c)). A rental agreement is much like an asset protection plan: your lawyer should prepare one specifically for you. Consequently, instead of trying to devise a "universal" form, I decided to provide you with a list of rental agreement must’s, should’s and cannot’s. That way, you will be able to start with whatever agreement you presently have and modify it so that it has all of the legally required provisions, does not contain prohibited provisions, and contains all or some of the provisions that I recommend you, as a landlord, include in your rental agreement. (a) Disclosure of manager and owner or owner’s agent; out-of-state owners must have statutory agent; and registration of all residential rental property. As discussed below, the Arizona Residential Landlord and Tenant Act (the "Act") does not require that the rental agreement be written. Nevertheless, even in the absence of a written rental agreement, the landlord must disclose to the tenant, in writing, at or before the commencement of the tenancy, the name and address of: (1) the property manager and (2) the owner or the owner’s agent (such agent must be authorized to accept notices, demands, and service of process). Moreover, this information must be kept current and refurnished to the tenant upon request. In 1999, a law was enacted requiring out-of-state residential landlords to have an in-state statutory agent. Do not confuse a property manager with a statutory agent. A property manager manages the property, collects rent, etc., whereas a statutory agent merely receives notices and legal service of process on behalf of the owner. The statutory agent must live in this state and accept legal service (i.e., delivery of notices and lawsuits) on behalf of the owner. The name, address and telephone number of the statutory agent must be provided to the county assessor’s office. Failure to comply with this requirement subjects the owner to substantial fines (i.e., mandatory $1,000.00 fine, plus $100.00 for each month of violation). (Note: statutory agent services for Arizona residential rental property are available through the Casler Law Office: 602-255-0101). Also in 1999, a law was enacted that requires all owners (i.e., in-state owners and out-of-state owners) of residential rental property to provide the county assessor with: (1) the name, address and phone number of the owner, (2) the street address and parcel number of the rental property, and (3) the year the rental property was built. If the residential rental property is owned by a business entity (i.e., corporation, LLC, partnership, etc. ), a specific point of contact (i.e., the name, address and phone number of a person) must be provided. (b) Deliver a signed copy of the written rental agreement to the tenant. The Act does not require a written rental agreement, but where the rental agreement is written, the landlord must deliver a signed copy of the rental agreement to the tenant within a reasonable time after the agreement is executed or, at the latest, upon move-in. (c) The written rental agreement must be complete. All blank spaces on a written rental agreement must be completed. Failure to complete all blank spaces is a material noncompliance by the landlord. This is particularly important when using the generic forms from the local stationery store because they contain a plethora of blank spaces in an attempt to accommodate everyone and to suit every situation. Again, spending some time and money to have your lawyer prepare your rental agreement to your specifications and to suit your particular needs will greatly reduce the number of blank spaces on the form, thereby reducing the chance of leaving one or more spaces blank. The consequence of inadvertently leaving a space blank may be no consequence at all or may mean a completely unenforceable rental agreement, depending on the judge. Bottom line - fill in all the blank spaces; if something doesn’t apply, write in “N/A” (for “not applicable”). (d) The purpose of nonrefundable fees/charges must be stated in writing. The purpose of all nonrefundable fees and charges must be stated in writing. Usually, the logical place to put this information is in the rental agreement. The exception being a nonrefundable application fee, which should be disclosed on the Application Form. The purpose of all nonrefundable fees or deposits shall be stated in writing by the landlord. Any fee or deposit not designated as nonrefundable shall be refundable. This language is clear: you must designate nonrefundable fees and deposits as nonrefundable and you must state the purpose of the nonrefundable fee or deposit. So what is the purpose of a nonrefundable cleaning and/or redecorating fee? The answer will vary from property to property. By way of example, consider the following rental agreement provisions, which I have included in my own rental agreement. (Note: my recommended clauses appear in this article indented and in italics, like those below). The nonrefundable cleaning fee is for additional cleaning performed by Landlord after Tenant vacates the rental unit, including sanitizing the kitchen and bathrooms, cleaning of window and floor coverings and cleaning/replacement of air-conditioning filters. The nonrefundable redecorating fee is for periodic replacement and/or repair of floor and window coverings, decorative items and periodic painting. The nonrefundable pet fee is to compensate Landlord for the additional wear and tear on the carpet, floor, drapes, etc., and the additional cleaning required thereto. The nonrefundable application fee is used to defray the administrative expense of processing and screening prospective applications. The nonrefundable re-keying fee is for installing new locks on the rental unit just prior to the new tenant moving in and providing the keys to the new tenant, which is intended to prevent entry into the rental unit by unauthorized personnel and for the new tenant’s security and peace of mind. Naturally, the foregoing are just examples. The language that you include in your rental agreement must accurately reflect the purpose of the nonrefundable fees or deposits that you collect. Two additional points. First, the statute talks about “nonrefundable fees or deposits.” Which means that you may refer to a nonrefundable item as a “deposit” or a “fee.” For clarity, however, I recommend referring to any nonrefundable item as a “fee” or “charge,” rather than a deposit. The word “deposit” normally denotes an amount of money that the tenant is entitled to receive back, if certain conditions are met. A “fee” or “charge” puts the tenant on notice that this amount will not be refunded, under any conditions. Second, the language of the statute addressing deposits was changed in 1995. Prior to 1995, it referred to “cleaning and redecorating deposits.” Now it refers to “all nonrefundable fees or deposits.” The change in the language means that the legislature recognizes that there are more nonrefundable fees and deposits than just cleaning and redecorating. For example, you may have a mail box or pool key deposit or a pet owner’s fee or charge. Again, the use of the word “fee” or “charge” will alert the tenant that this amount is nonrefundable, whereas the word “deposit” will inform the tenant that s/he must meet certain obligations before this amount will be refunded. One last item. Remember to tally up all the “deposits” that you collect. The maximum you may collect as “security,” however denominated, is an amount equal to one and one-half months rent (in addition to the first month’s rent). The Act defines “security” as “money or property given to assure payment or performance under a rental agreement.” This will include pet owner deposits (but not nonrefundable pet owner fees), key deposits, cleaning and redecorating deposits (but not nonrefundable cleaning or redecorating fees). An example may be helpful. Assume rent is $1,000 per month and that you collect a $1,500 security deposit. You may also collect a nonrefundable pet fee or charge of any reasonable amount, but you may not collect a refundable pet owner deposit of any amount, because you are already at the one and one-half month’s rent maximum. Similarly, you may also collect a nonrefundable cleaning and/or redecorating fee or charge of any reasonable amount, but you may not collect a cleaning or redecorating deposit of any amount, for the same reason as stated above. (e) Rental agreements longer than one year must be written. The Act does not require that the rental agreement be in writing. Other sections of the law, however, provide that contracts that cannot be performed within one year must be in writing to be enforceable. Therefore, rental agreements that provide for specific lease periods in excess of one year must be in writing. For example, a lease from January 1, 2009 to December 31, 2009, need not be in writing, but a lease from January 1, 2009 to January 1, 2010, must be in writing to be enforceable. On the other hand, a month-to-month tenancy need not be in writing even though the tenancy continues for more than one year. For example, you rent an apartment to a tenant on January 1, 2009, on a month-to-month basis. The tenant continues to rent the apartment beyond January 1, 2010. The rental agreement need not be in writing and is enforceable. This is true even if the tenant continues to rent for ten or twenty years. The reason is because a month-to-month tenancy terminates at the end of each month and is renewed each month, thereby complying with the requirement that the contract may be performed within one year. (f) Give notice that the Act is available free. 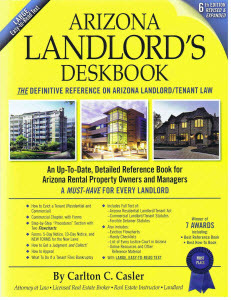 [I]nform the tenant in writing that a free copy of the Arizona Residential Landlord and Tenant Act is available from the Arizona Secretary of State’s Office. The logical place to do this is in the rental agreement. If you do not use a written rental agreement, however, then you must nevertheless provide this notice to the tenant, in writing, at or before commencement of the tenancy. (g) Give the tenant a move-in inspection form. [W]ith respect to tenants who first occupy the premises or enter into a new written rental agreement after January 1, 1996, upon move-in a landlord shall furnish the tenant with a ... move-in form for specifying any existing damages to the dwelling unit ... . I recommended the use of a Property Inspection Checklist (Form 3, Appendix B) long before it was required by law. Now it is required. Use of a Property Inspection Checklist is simply good business. Landlords and tenants often forget that there was a hole in the carpet in the living room, that the kitchen counter already had scratches, and/or that the interior of the unit was completely repainted just before the tenant took possession. A Property Inspection Checklist, or any similar form, ensures that tenants are financially responsible for damage that they cause and not responsible for damage that was pre-existing. Giving the move-in inspection form is required. Taking photographs is not required. But the prudent landlord knows that “a picture is worth a thousand words,” and that is rarely more true than in the landlord/tenant context. We now live in the digital age. Whereas taking 100 photographs of a rental property before tenancy and then after tenancy used to be expensive (i.e., cost of film and then developing), it is now almost free, except for the initial investment in a digital camera. A notation of “no noted defects” on the move-in inspection and “large burn in the bedroom carpet” may be sufficient evidence for a judge, but a photograph taken before and then after (of the large, crusty burn hole in the carpet) would be more than sufficient, it would be compelling. Taking “before” and “after” pictures of your rental units should become standard procedure for every landlord. (h) Give notice that tenant may be present during the move-out inspection. [W]ith respect to tenants who first occupy the premises or enter into a new written rental agreement after January 1, 1996, upon move-in a landlord shall furnish the tenant with ... written notification ... that the tenant may be present at the move-out inspection. Upon request by the tenant, the landlord shall notify the tenant when the landlord’s move-out inspection will occur. This does not mean that you must schedule a date/time that is convenient for the tenant; but you may, if you wish. On the other hand, you should not schedule a date/time that is intentionally inconvenient for the tenant. Schedule a date/time that is convenient for you and that is consistent with your prior business practices (i.e., only in the morning, only in the afternoon, only on particular days, etc. ), and then provide a notice to your tenant of the date and time. As an exception to the rule (above), you are not required to notify and/or conduct a move-out inspection with the tenant present if you have evicted this tenant for a material and irreparable breach and you have reasonable cause to fear violence or intimidation on the part of the tenant. (i) Give the tenant a pool safety notice. Arizona has a pool barrier law. This law has two separate parts. The first part (which is a physical requirement and cannot really be included in a rental agreement) requires a barrier (i.e., a fence or some other barrier) around pools and spas. The second part requires a landlord to give a pool barrier notice to the tenant. A person on entering into an agreement to build a swimming pool or contained body of water or sell, rent or lease a dwelling with a swimming pool or contained body of water shall give the buyer, lessee or renter a notice explaining safety education and responsibilities of pool ownership as approved by the department of health services. Failure to give this notice is a petty offense. More importantly, it may cause the loss of child’s life, which will haunt you for the rest of your days, and will likely result in civil liability for you, the landlord. When do you need to give the pool safety notice? Whenever you rent a property with a pool or “contained body of water” to a tenant. What is a “contained body of water”? A body of water eighteen inches or more in depth at any point and that is wider than eight feet at any point and is intended for swimming. Do I need to use this notice if I rent a property that has access to a community pool (i.e., a condominium or townhouse)? Yes, because you are renting a “dwelling unit with a swimming pool or contained body of water,” which falls squarely within the language of the statute quoted above. Moreover, with so much at stake (i.e., children’s lives), there is no excuse for not doing everything in your power to help prevent a child from drowning. Besides (have you forgotten already? ), you are suppose to err conservatively (see Chapter 2(A)(7), “Err Conservatively”) and avoid litigation (see Chapter 2(B), “Legal Advice to Landlords”). Does this law apply state wide? Yes, unless the local municipality (i.e., county, city or town) has enacted a pool barrier ordinance. It is possible that the local ordinance has more or stricter requirements than the state law. Check the pool barrier requirements for the location of your rentals. Pool barrier contact information for each Arizona city and county is available online: http://www.aaronline.com/documents/pool_info.aspx. (j) Must disclose real estate license, but not law degree. As a licensed real estate agent or broker in the State of Arizona, you are required by the Arizona Department of Real Estate to disclose to the buyer, in a sales transaction, and to the tenant, in a rental transaction, that you hold an Arizona real estate salesperson’s or broker’s license and that you are acting as the principal (i.e., for your own properties). This is because the Real Estate Commissioner for the State of Arizona believes that such information may be material to the other party and to prevent agents/brokers from taking advantage of the general public. My personal opinion is that this disclosure makes sense. Oddly enough, there is no parallel requirement for lawyers to make such a disclosure. Yes, there is a professional code of conduct that governs the conduct of attorneys, but most relate to what a lawyer can or cannot do when representing a client. Nevertheless, I view this as material information that may give rise to litigation if not disclosed and, therefore, I recommend that it be disclosed in the rental agreement. One or two short sentences are sufficient. The Owner is licensed as a real estate broker [or salesperson] in the State of Arizona. The Owner is licensed as an attorney in the State of Arizona. (k) Provide for rental tax increases. Pursuant to A.R.S. § 33-1314(E), Landlord may adjust rental tax with thirty days notice if changed by the municipality during the term hereof. You may then simply provide the tenant the appropriate notice. (See Form 12, Appendix B). If you fail to include this language, however, you must wait until the lease is renewed and then negotiate an increase in the rental amount. If you own one rental unit and the rental tax changes, it may be no big deal; if you own a 1,000 unit apartment complex and the rental tax changes, failure to include this provision may represent a significant loss of revenue. (l) Give the tenant notice about lead-based paint. Federal law now requires landlords to make disclosure about the presence of lead-based paint and lead-based paint hazards. This section will make compliance with this law easy. Disclosure is required for “target housing.” Target housing includes residential properties built before 1978. If your rental units were built after 1978, no disclosure is necessary. Stop; you are done. Nothing further is required of you (unless your property was built after 1978 and you know that lead-based paint and/or lead-based paint hazards exist on the rental property; if this applies to you, read on). Nevertheless, when I draft a rental agreement, to eliminate any argument that I failed to address this point, I note that the property was built after 1978 and that no lead-based paint and/or lead-based paint hazards exist on the property. The following provision in the rental agreement will suffice. The leased premises were built after 1978. No known lead-based paint and/or lead-based hazards exist on the premises. Of course, this must be true. If the property was built after 1978, but you have knowledge of lead-based paint in the leased premises and/or any lead-based paint hazards existing in, or on, the leased premises, then you cannot lawfully include this provision in your rental agreement and you must make a different disclosure (see below). ● Disclose the presence of known lead-based paint and/or lead-based paint hazards (a lead-based paint hazard includes lead-based paint that is chipping, cracking or peeling; it also includes dust caused at friction points, such as doors, windows and stairs). The key is that you must disclose your actual knowledge of lead-based paint and/or lead-based paint hazards. You are not required to conduct any type of testing. If you know that lead-based paint exists in the property and/or you have had tests conducted by a company competent to perform lead-based paint and lead-based paint hazard testing, then you must disclose this information. Disclosure must occur before the tenant is obligated under the rental agreement. This requirement can be met if the disclosure is made a part of rental agreement. ● For multiple units, the landlord must disclose unit specific information (i.e., specific to the unit/apartment being rented) and common area information. ● Provide the tenant with a copy of the tests results and/or report. ● Provide the tenant with a federally approved lead-based paint hazard information pamphlet. • Alternatively, the pamphlet has been reproduced in Appendix B. You may make copies and provide your tenant with a copy, thereby satisfying this requirement (but you must provide the tenant with a complete copy of the pamphlet, not just part of it; follow the instructions accompanying the pamphlet in Appendix B, immediately following Form 6, the lead-paint disclosure form). ● The rental agreement must include certain specified disclosure language. So, if disclosure is required, how do I comply with the law? If your property was built before 1978 or you know that lead-based paint and/or lead-based paint hazards exist on the property, then include the following provision in the rental agreement and use Form 6 in Appendix B. This will satisfy the legal requirements. The leased premises were built before 1978 and/or known lead-based paint and/or lead-based hazards exist on the premises. See the attached Lead-Based Paint Addendum. Don’t omit these provisions. The civil penalty is up to $10,000 for each violation. Knowingly and willfully violating this law is punishable by up to one year of imprisonment. These penalties are in addition to the penalties under state law. If you own rental property in certain areas in Phoenix, Arizona, you may be eligible for free lead testing and/or removal. To find out more, call the City of Phoenix, Lead Hazard Control Program, (602) 534-3757. (1) The first is the EPA/HUD Fact Sheet, “EPA and HUD Move to Protect Children from Lead-Based Paint Poisoning; Disclosure of Lead-Based Paint Hazards in Housing,” EPA-747-F-96-002, March 1996 (revised 12/96); this Fact Sheet summarizes the governmental concern, the requirements, and the types of properties affected. (2) The second is the EPA Fact Sheet, “Identifying Lead Hazards in Residential Properties,” EPA 747-F-01-002, April 2001; this Fact Sheet summarizes the types of lead-based paint hazards and the standards for measuring when it is a hazard. (a) The rental agreement should be written. Even if you intend to rent a piece of real estate for one week, the rental agreement should be in writing. Why? Because the rental agreement is the source of the landlord’s rights, except for the pitiful few rights granted the landlord by the Act. It is certainly true that an oral rental agreement is as enforceable as a written rental agreement drafted by the best attorney in the state, if not challenged. If challenged in a court of law, however, an oral rental agreement normally equates to no rental agreement because the tenant’s version of “the agreement” will vary greatly from your version of the agreement. In such a case, the judge is forced to decide whether one of the parties is lying or whether both are telling the truth, which, in the latter case, means that there never really was an “agreement” (i.e., a meeting of the minds) and, therefore, the “agreement” cannot be enforced. If, on the other hand, the landlord and tenant disagree on what a particular provision was, the judge is in the unenviable position of having to decide who is telling the truth. For example, assume the landlord says the agreed monthly rent was $500, but the tenant contends the agreed monthly rent was $400. In this case, the judge is forced to decide whether one of the parties is lying or whether both are telling the truth. If the court concludes that both are telling the truth, then the court will find that there never really was an “agreement” (i.e., a meeting of the minds) and, therefore, the “agreement” cannot be enforced. (b) The written rental agreement should be comprehensive. While a thirty-page residential rental agreement may be too much, a few notes scribbled on a napkin is probably too little. Where there are “gaps” in an oral or written rental agreement, the provisions of the Act apply. For example, assume you have an oral or written agreement with a tenant, specifying $500 rent for a particular rental unit, but do not discuss when rent is due. The Act fills in this “gap.” The Act provides, “rent is payable at the beginning” of the specified term, which in the case of a month-to-month tenancy, would be at the beginning of the month. The Act, however, is not comprehensive and not all contingencies are accounted for. Moreover, the Act favors the tenant – is that what you want? Your rental agreement should be as comprehensive as possible without being too long. And, naturally, it should favor the landlord – after all, whose side are you on? (c) The rental agreement should provide for abandonment. If provided by a written rental agreement, the landlord may destroy or otherwise dispose of some or all of the property if the landlord reasonably determines that the value of the property is so low that the cost of moving, storage and conducting a public sale would exceed the amount that would be realized from the sale. Tenant expressly authorizes landlord to dispose of abandoned property and property left on the premises by tenant after tenancy has terminated, in any manner landlord deems fit, where the landlord reasonably determines that the value of said property is so low that the cost of moving, storing and conducting a public sale would exceed the amount that would be realized from the sale. Tenant holds landlord harmless for loss of property and/or value of said property disposed of under these circumstances. These are not “magic words.” Any similar clause that clearly conveys this message will suffice under the statute. Feel free to use mine or compose your own, but be sure you put some type of provision addressing abandoned personal property into your rental agreement. When actually faced with the prospect of disposing of a tenant’s abandoned property, I strongly recommend taking pictures and/or video taping the property (before you “dispose” of it). A witness and, if possible, an appraisal or estimate of value, are also well advised. (d) The rental agreement should provide for payment of expenses incurred to bring legal action. The Act provides that after a Special Detainer action has been filed, the tenant may reinstate the rental agreement only by paying past due rent, late fees, attorneys’ fees and court costs. Your rental agreement should also include this language. Landlord and Tenant agree that the prevailing party in any litigation, action or controversy arising from this Rental Agreement shall be entitled to reimbursement of or, if appropriate, an award of reasonable attorneys’ fees, litigation expenses and court costs incurred prior to trial, during trial, post-judgment and/or on appeal, without regard to whether or not the matter is contested. This language, however, is not an iron-clad guarantee. I have seen some judges (normally in justice court) refuse to award attorneys’ fees regardless of the language in the rental agreement. This practice is not fair and is certainly contrary to the express language of the contract (i.e., the rental agreement), but, unfortunately, the only way to correct this “bad decision” is to appeal the decision of the judge. The appeal process is normally not cost effective, in terms of time, effort and cost. Because of the myriad of variables involved, if your rental agreement provides for payment of attorneys’ fees and you are denied an award of attorneys’ fees, you should consult your attorney to discuss your (cost effective) options. (e) The rental agreement should provide for payment of “other expenses” incurred by the landlord. It costs money to prepare and deliver notices (i.e., Five-Day Notice to Pay or Quit, etc. ), but there is nothing in the Act that allows you to collect a fee for this effort. On the other hand, there is nothing in the Act that prohibits including a provision in the rental agreement that obligates the tenant to pay notice fees. Furthermore, Arizona law permits parties to contract as they wish (except for contracts for illegal purposes or which are against public policy). Consequently, you should consider including language in your rental agreement that allows you to collect a fee (i.e., $25.00, or some other “reasonable” amount) for preparation and service of notices. The key, however, is to enforce your rights; if the tenant decides to reinstate the rental agreement after a monetary default, then insist upon collecting all charges – the past due rent, the late charges, notice fees, etc. – make no exceptions. You may also wish to assess and collect an “Application Fee.” Keep in mind that because it is a fee, it is nonrefundable and, therefore, it must be designated as a nonrefundable fee and the purpose of the fee must be stated in writing (i.e., on the Application Form). (See Chapter 2(D)(1)(d), “Nonrefundable fee/charges must be stated in writing”). I have also heard of a landlord (i.e., a landlord for a single-family home, located some distance from his own home) who included a “drive-by fee” in his rental agreement, which he assessed when he was “forced” to travel to the rental unit to personally collect overdue rent, hand-deliver notices, or any time he had to physically visit the rental unit. Again, this type of provision is not expressly prohibited by the Act. Nevertheless, there is no guarantee that a court of law will enforce this provision or similar provisions merely because they are included in the rental agreement. You have a greater chance of succeeding in court if the fee charged is “reasonable” and assessment of the fee is tied to some type of default of the tenant. (f) The rental agreement should provide for the Tenant’s maintenance obligations. Unless specifically addressed in the rental agreement or stated in the Act, your tenant will claim that you are responsible for certain items of maintenance, not s/he. Therefore, to avoid litigation, it behooves you to specifically address certain items. Lawn care for a multi-unit complex is almost always the responsibility of the landlord. In the case of townhouses or condominiums, lawn care for common areas is usually the responsibility of the homeowners’ association and lawn care for individually owned areas (i.e., fenced back yards, etc.) is usually the responsibility of the owner. In the case of a single-family house, the tenant is usually responsible for lawn care. When you allocate responsibility for the lawn care (i.e., to the tenant or to the landlord), you should consider many factors, including your willingness to do or arrange for the lawn maintenance; the ease of access to the property for you or your lawn service company; the complexity of the maintenance schedule (i.e., a small Bermuda grass lawn versus a tiff grass lawn, with one or more gardens of high maintenance flowers); the cost of providing lawn care for the tenant; and the potential cost to replace plants killed by the tenant if not properly maintained. You may also wish to include language in your rental agreement that provides that the landlord may undertake responsibility for lawn care and bill the tenant for the expense thereof if the tenant fails to adequately maintain the yard after having been notified by the landlord on three prior occasions (i.e., three 10-Day Notices for Material Noncompliance). Note: you could also evict the tenant for a second material noncompliance of the “same or similar nature.” See Chapter 5, Section B(3)(e). Few tenants have the ability or inclination to properly perform pool maintenance. The financial risk of allowing the tenant to be responsible for pool care and maintenance is great. With very few exceptions, I recommend that the landlord retain responsibility for pool maintenance. This will ensure that the pool is properly maintained. The tenant may very well be willing to pay the added expense of having a pool service company perform regular care and maintenance. If not, your own peace of mind may be well worth absorbing the cost. Pest control is normally a landlord’s responsibility when the rental unit is part of a multi-unit complex (i.e., an apartment complex) and the landlord has control over the adjoining units. On the other hand, when the rental unit is a single-family residence, pest control may be a tenant’s responsibility. Make a decision regarding who will be responsible for pest control and include appropriate language in the rental agreement. Before making a final decision, however, there are other considerations. If the landlord is responsible for pest control and the tenant fails to properly store food and/or clean the kitchen, pest control may become a significant problem and, because pest control is your responsibility, it may look like your fault. On the other hand, if pest control is the tenant’s responsibility and the tenant fails to do any pest control, you may have a rampant infestation to clean up when the tenant vacates. (4) Light bulbs and other “expendables”. You will be surprised how petty some tenants can be. It isn’t so bad when a new tenant insists you replace a few light bulbs when s/he first moves in, but continued requests to replace bulbs can be annoying and tenants who take all the light bulbs with them when they vacate are absolutely exasperating. Conceivably, a tenant could reasonably argue that the landlord has the responsibility to “[m]aintain in good and safe working order ... all electrical ... facilities and appliances,” including responsibility for replacing any inoperable light bulbs. To avoid this problem, allocate responsibility for light bulbs to the tenant and require that all bulbs be present and operable when the tenant vacates (this gives you express contractual authority to deduct the cost of light bulbs from the tenant’s security deposit if the tenant fails to comply). You should also allocate responsibility for other “expendables” (i.e., batteries, garden hoses, etc.) to the tenant. Air filters are cheap. Nevertheless, tenants will not buy them and they will not replace them on a regular basis. Because the consequences of failing to regularly replace filters is so dire (i.e., the air conditioner or heat pump may become inoperable), the landlord should just accept this responsibility. This is not a burden; rather, it is a license to do a quick inspection of the premises every month. Put in the rental agreement that the landlord is responsible for replacing the air conditioning filter every month or as often as reasonably required. When you (or your maintenance man) go to the property to change the filter, you will have an opportunity to take a quick look at the condition of the premises and inquire about anything you wish. Because your monthly visit will become “routine,” you may catch the tenant off guard and discover unauthorized pets, unauthorized occupants, controlled substances in plain sight, and/or unauthorized use of the property (i.e., business operations, structural modifications, etc.). A word of caution, however, you must still give the tenant two days’ advance notice of your intent to enter the rental unit. (See Form 12, Appendix B). In addition, you should state in your rental agreement that you inspect and/or replace air-conditioning filters monthly, so as to avoid any allegations by the tenant that you are “harassing” the tenant by conducting “too many” inspections. 1. Comply with the requirements of applicable building codes materially affecting health and safety. 2. Make all repairs and do whatever is necessary to put and keep the premises in a fit and habitable condition. 5. Provide and maintain appropriate receptacles and conveniences for the removal of ashes, garbage, rubbish and other waste incidental to the occupancy of the dwelling unit and arrange for their removal. 6. Supply running water and reasonable amounts of hot water at all times, reasonable heat and reasonable air-conditioning or cooling where such units are installed and offered, when required by seasonal weather conditions, except where the building that includes the dwelling unit is not required by law to be equipped for that purpose or the dwelling unit is so constructed that heat, air-conditioning, cooling or hot water is generated by an installation within the exclusive control of the tenant and supplied by a direct public utility connection. C. The landlord and tenant of a single family residence may agree in writing, supported by adequate consideration, that the tenant perform the landlord’s duties specified in subsection A, paragraphs 5 and 6 of this section, and also specified repairs, maintenance tasks, alterations and remodeling, but only if the transaction is entered into in good faith, not for the purpose of evading the obligations of the landlord and the work is not necessary to cure noncompliances with subsection A, paragraphs 1 and 2 of this section. 1. The agreement of the parties is entered into in good faith and not for the purpose of evading the obligations of the landlord and is set forth in a separate writing signed by the parties and supported by adequate consideration. 2. The work is not necessary to cure noncompliance with subsection A, paragraphs 1 and 2 of this section. 3. The agreement does not diminish or affect the obligation of the landlord to other tenants in the premises. Only allow the tenant to perform repairs or modifications to the rental unit if you are confident that the tenant is qualified to perform the job and that s/he has the necessary tools available to do the job correctly. The statute requires that these types of agreements be written and, in some cases, that it be a written agreement separate from the rental agreement. I recommend that this type of written agreement be separate from the rental agreement in all cases. I also recommend that, in this separate written agreement, you address who assumes responsibility for injury to the tenant and/or others as a result of the tenant’s construction efforts. Even if you allocate all risk and responsibility for liability to the tenant, make sure you are adequately insured. Then, re-think this decision one more time, to see if you really want to enter into this type of agreement with a tenant. I recommend against such agreements, except to transfer responsibility for minor maintenance (i.e., lawn maintenance, pool maintenance, pest control, etc.) and one other area – safety. If a tenant asks that they be allowed (at their expense) to rekey the rental unit and/or add an additional lock and/or add some other type of “reasonable” security measure, I will generally allow the modification. This normally comes about as a result of a domestic violence dispute, a restraining order or some other type of action that causes the tenant to fear for their safety. In these types of cases, I imagine the worst case scenario (i.e., serious injury or death to the tenant) and then try to picture myself on the witness stand answering the question: “As we all now know, this simple modification would have prevented the death to Ms. Tenant; please tell the jury again why you denied the late Ms. Tenant’s request to allow her to add, at her own expense, a simple deadbolt lock to her door.” Viewed in this light, any reasonable request that relates to a tenant’s safety should be granted. (g) The rental agreement should provide for regular inspections. The Act allows the landlord access to the rental unit for inspections, repairs, alterations, improvements, etc. The landlord, however, must provide the tenant with at least two days’ advance notice of the landlord’s intent to enter the premises and the landlord may enter the premises only at reasonable times. (See Form 12, Appendix B). It is possible that a monthly inspection could be interpreted by a judge as harassment and/or abuse of the landlord’s right of access unless the rental agreement contains a specific provision regarding the frequency of inspections (i.e., monthly). It will be very difficult for a tenant to claim that monthly inspections are “too frequent” if the rental agreement, which the tenant read and signed before s/he moved in, specifically states that inspections will be conducted monthly. Consequently, if you plan to inspect your rental units frequently, then your rental agreement should disclose the frequency of your inspections (i.e., monthly, bi-monthly, quarterly, etc.). B. If the tenant notifies the landlord of a service request or a request for maintenance as prescribed in Section 33-1341, paragraph 8, the notice from the tenant constitutes permission from the tenant for the landlord to enter the dwelling unit pursuant to subsection D of this section for the sole purpose of acting on the service or maintenance request. D. The landlord shall not abuse the right to access or use it to harass the tenant. Except in case of emergency or if it is impracticable to do so, the landlord shall give the tenant at least two days' notice of the landlord’s intent to enter and enter only at reasonable times. E. The landlord has no other right of access except by court order and as permitted by § 33-1369 and § 33-1370, or if the tenant has abandoned or surrendered the premises. The new law was passed by the legislature in 2007. Nothing in paragraph B expressly eliminates the notice requirement of paragraph D. Moreover, when paragraph B is read in conjunction with paragraphs D and E, which make clear that the landlord has only limited access to the rental unit, it leads me to conclude that notice to the tenant is still required. Consequently, to “err conservatively” (see Chapter 2(A)(7)), I recommend giving the tenant a notice before entering to make repairs, whether or not the repairs were requested by the tenant. This conclusion is also supported by the fact that the text of the new law, as first proposed, expressly eliminated the need to give a notice, but the version of the new law that was ultimately passed by the legislature deleted the language about not having to give notice. (h) The rental agreement should address “reasonable” modifications and alterations. Generally, landlords do not allow tenants to make any structural modifications and/or alterations to the rental unit. If, however, you do allow a tenant to make modifications and/or alterations, you should precisely define the limits of the tenant’s right to modify and/or alter the property and, in any event, require written notice by the tenant to the landlord before any work is commenced. Naturally, all work should be performed by qualified and licensed workers, not by the tenant (see Section D(2)(f), above). The foregoing is the exception, not the rule. Most landlords do not permit modifications and/or alterations. What many landlords do encounter, however, are requests from tenants regarding: painting a wall, a room or the entire unit; putting hooks in the ceiling to hang plants; putting nails in the walls to hang pictures; installing closet organizers; etc. Obviously, the simple thing to do is to require landlord approval for all such modifications. The key, however, is getting the tenant to understand that putting a nail in the wall to hang a picture is a structural modification requiring landlord approval. This may be accomplished in the rental agreement or in separate rules and regulations, but is only effective if the tenant remembers this provision. Tenants will generally want to make these types of modifications immediately upon move-in. Consequently, you may wish to supplement your forms by posting a temporary notice inside the rental unit in a conspicuous spot (i.e., taped to the refrigerator, taped to the inside of the front door, etc. ), that repeats these restrictions. In this way, the tenant will be reminded of these restrictions during move-in, which is when the tenant is most likely to violate (inadvertently or intentionally) these limitations. (ì) The rental agreement should provide how partial payments (if accepted) are applied to amounts due. Partial rent payments most frequently arise immediately after service of a Five-Day Notice to Pay or Quit. Many times, a tenant wants to stay, but, for whatever reason, s/he does not have the full amount due. If a tenant wants to reinstate the rental agreement after you have served a Five-Day Notice to Pay or Quit, but the tenant only has part of the amount due, and you want to accept a partial payment (you are not required to accept less than full payment), you are free to do so, but make sure you have the tenant sign some type of written agreement (i.e., “a contemporaneous writing”). If you do not wish to accept a partial payment, merely send the payment back to the tenant with a note that you will not accept a partial payment. For those instances where you do wish to accept less than the full amount due (otherwise, how you apply payments is not an issue), your rental agreement should provide for how (i.e., to which of the amounts that are due) partial payments are to be applied. If it does not, but you wish to accept a partial payment, you should have your tenant sign a document that spells out how the partial payment is to be applied and that protects your rights (see Appendix B, Form 10). Partial payments should be applied as follows: first, to legal fees and court costs, then to accrued interest on any amounts owed to the landlord, then to late fees, then to amounts owed for damages to the property, then to any other amounts owed by the tenant to the landlord, then to unpaid past due rent, and finally to prepaid rent. If your rental agreement provides for how partial payments are to be applied, it should also provide that you are not obligated to accept partial payments. This will prevent a “creative” tenants’ lawyer from arguing that language in your rental agreement about how partial payments are applied, implies an obligation to accept partial payments. So, what about partial payments? Can you accept a partial payment without waiving your rights? Yes, but be careful and “get it in writing.” The Act was changed in 1992 (and has subsequently been amended) to allow landlords to accept partial payments without waiving the landlord’s rights. A landlord is not required to accept a partial payment of rent or other charges. A landlord accepting a partial payment of rent or other charges retains the right to proceed against a tenant only if the tenant agrees in a contemporaneous writing to the terms and conditions of the partial payment with regard to the continuation of the tenancy. The written agreement shall contain a date on which the balance of the rent is due. The landlord may proceed against a tenant in breach of this agreement or any other breach of the original rental agreement as provided in article 4 of this chapter and in title 12, chapter 8. If you accept a partial payment, the tenant must “agree in a contemporaneous writing” that the landlord is reserving his/her right to collect the full amount due and to pursue all available legal action. The consequences of failing to do so are severe. Acceptance of rent, or any portion thereof, with knowledge of a default by tenant or acceptance of performance by the tenant that varied from the terms of the rental agreement or rules or regulations subsequently adopted by the landlord constitutes a waiver of the right to terminate the rental agreement for that breach, except as specified in subsection A of this section. A simple form, such as a rent receipt book that shows the amount due, the amount paid, and the amount remaining due, will suffice. Merely have the tenant sign or initial the receipt, give the tenant a copy and retain the original for your records. This will satisfy the “contemporaneous writing” requirement of the statute. Alternatively, use Form 10, Appendix B. If the tenant fails to pay the balance due on the due date specified in the “contemporaneous writing,” and you have already served the Five-Day Notice to Pay or Quit, you need not serve another Five-Day Notice. If the landlord has provided the tenant with a notice of failure to pay rent as specified in section 33-1368, subsection B [Five-Day Notice to Pay or Quit] prior to the completion of the agreement for partial payment, no additional notice under section 33-1368, subsection B is required in case of a breach of the partial payment agreement. (j) The rental agreement should provide for a reasonable late fee. Late fees are only collectable if they are specified in a written rental agreement (another good reason to have a written rental agreement). If you have an oral rental agreement or if your written rental agreement does not specifically state that the landlord may collect late fees and the amount thereof, the landlord cannot collect late fees. I frequently have landlords tell me that they have oral rental agreements and have collected late fees for many years. I have little doubt that this is true and, in fact, I know this to be a common practice. If you ever go to court, however, the law does not permit the judge to award late fees to the landlord unless the late fee is stated in a written rental agreement. In addition to the foregoing, to be enforceable and collectable, late fees must be “reasonable.” What is “reasonable” will vary from unit to unit. I have seen a judge “strike” (i.e., deem unenforceable) a $10.00 per day late fee on a $1,000.00 per month rental and another judge find the same provision “reasonable.” I have also seen a judge strike a $10.00 a day late fee on a commercial lease for $1,800.00 per month. Consequently, I cannot answer the question: “What is a reasonable late fee?” I can tell you, however, that judges tend to favor a late fee provision that is proportionate to the magnitude of the offense. For example, assume you rent a property for $1,000.00 per month and that your late fee is expressed as a percentage (i.e., one percent) of the amount of rent outstanding, rather than as a flat rate (i.e., $10.00 per day). In this case, the amount of the late fee is proportionate to the offense – $10.00 a day late fee when the unpaid rent is $1,000.00. If the tenant had made a partial payment, $200.00 for instance, then the unpaid rent would be $800.00 and the late fee would only be $8.00 per day. In this way, the late fee is always proportionate to the size of the offense (i.e., the amount of due and unpaid rent). I cannot guarantee that a one, two or three percent late fee will always be enforceable. I cannot even guarantee that all judges will favor a percentage late fee over a flat rate late fee. I can tell you, however, that most judges that I have encountered have found a percentage late fee to be reasonable and that I have seen these same judges strike flat rate late fees. It is now up to you to decide whether you will use a flat rate, a percentage, or some other type of late fee. Whatever method you use, make sure you include some type of late fee. Otherwise, the tenant has no incentive to tender payment of rent on time. In addition, the late fee should accrue on a daily basis. If your late fee provision states that a fee (i.e., flat rate or percentage) will be assessed if rent is not paid by the fifth day of the month, but does not provide for daily charges thereafter, there is no incentive for the tenant to pay the delinquent rent as soon as possible after the fifth day of the month. (k) The rental agreement should provide for rental tax increases. At the risk of sounding redundant of Chapter 2, Section D(1)(k), you must include this provision in your rental agreement if you wish to change the rental tax rate you charge your tenants during an existing lease. Even if you do not now collect a rental tax or if you have a practice of changing the rental tax rate when existing leases come up for renewal, I believe that you should include the following language in your rental agreement, in case you change your mind. Use Form 12, in Appendix B, to give the tenant notice of the tax change and the corresponding increase in rent. (l) The rental agreement should include a liquidated damages provision. Scenario 1. The prospective tenant has paid you some amount of money to hold the rental unit and then, for whatever reason, changed his mind or for some reason “cannot” move-in. This person has not signed a rental agreement, has not received the keys and has not moved into the rental unit. What do you do? If you used Form 4 (in Appendix B), then there is nothing to do. The prospective tenant has paid a fee for the option to rent the rental unit. An option gives the optionee (i.e., the prospective tenant) the right to exercise the option and rent the rental unit, but not the obligation. This person has elected not to exercise his option, which he may do without consequence. The fee paid for this option, however, as made very clear by Form 4, is non-refundable. The only thing left for you to do is to find another prospective tenant. Scenario 2. The tenant has signed the rental agreement, paid you the initial amounts due under the rental agreement and has received the keys. Either before this tenant moved into the rental unit or any time prior to the end of the lease term (if he has a lease term and is not on a month-to-month tenancy), this tenant wants to terminate the rental agreement and/or has moved out. What do you do? This tenant has broken the lease. There is no “three day cooling off period” or any other rule of law that allows the tenant to void the contract anytime during the term of the lease because of a job transfer, a death in the family or any other reason (except for a member of the military who has received orders for deployment or a Permanent Change of Station (PCS)). Once the tenant signs the contract, the tenant is obligated to fulfill the terms thereof. So what are your legal rights? The landlord may apply the security deposit to the payment of accrued rent and the amount of damages “actually” suffered as a result of the breach, subject to the landlord’s obligation to mitigate (i.e., reduce) his/her damages. What are your “actual damages?” The rent you lost because the tenant did not move in or moved out before the end of the lease term, the advertising expenses you will incur to re-rent the property, any commissions that you paid to a real estate agent or broker that will not be refunded to you, and any other expense reasonably incurred to re-rent the property. The parties hereby agree that in the event Tenant fails to take possession of the unit after signing the rental agreement or for any reason vacates the premises before the end of the rental term, then landlord may assess and collect a fee in the amount of $_______, which the parties hereby stipulate and agree is a reasonable approximation of landlord’s damages. Tenant expressly authorizes landlord to deduct this fee from the security deposit. So, how much should the fee be? A “reasonable amount,” which may be an amount equal to one month’s rent, one and one-half month’s rent, two month’s rent, or some other amount that you believe is a reasonable approximation of your damages. If it turns out that your actual damages are more or less than the amount stated in the rental agreement, the liquidated damages provision is still valid and binding. Don’t forget that you must nevertheless send the tenant an itemized statement of all deductions, including the liquidated damages amount, from his security deposit within fourteen business days. (See Chapter 5, Section B(7)(b)). (m) The rental agreement should include a jury trial waiver. Most landlords do not want a jury trial. Why? Because it delays trial of the action for possession until the court can summon a jury, which will normally take several days and may take weeks. In addition, if the landlord is represented by legal counsel, a jury trial will be an enormous expense. An ordinary Forcible Detainer action (if there is such a thing) will generally take less than one-half hour. A jury trial will take most of the day and can take much longer, depending on the number and complexity of issues involved. Most tenants want a jury. Why? For the same reasons above. They want additional time and they want to put the landlord to as much expense as humanly possible. How do we fix this problem? The right to a jury trial is found in the United States Constitution. The Arizona State Legislature also granted tenants the right to a jury trial. Parties to a contract, however, can agree to voluntarily waive the right to a jury trial. The question is whether an Arizona judge will find that a tenant’s agreement to waive a jury trial, in advance (i.e., at the time the rental agreement is signed, which will occur before any controversy arises), is enforceable? This is “leading edge” stuff. The law is not clear on this issue in Arizona. The tenant may argue that a jury trial is a right given to him/her by the Act and, pursuant to A.R.S. § 33-1315(A)(1), the tenant cannot agree to “waive or forego rights or remedies under the [Act].” The tenant’s right to a jury trial, however, is not found in the Act; it is found in the forcible detainer statutes. The Act does not state that the tenant cannot waive the right to a jury trial or any of the rights given to him/her by the forcible detainer statutes and, therefore, the tenant’s argument should fail. Moreover, case law (cited in prior footnotes) and statutory law exists that says parties to a contract can agree, in advance, to waive their right to a jury trial. Several factors will be important in helping the judge reach the right decision: (1) the waiver provision must be written in clear and unambiguous language; (2) the waiver provision must be conspicuous; (3) the negotiability of all contract terms, including the waiver provision; (4) the disparity in the parties’ bargaining power; (5) the knowledge and intelligence of the party opposing the waiver (i.e., whether the tenant has an eighth grade education or whether s/he has a Ph.D.); (6) and the business experience of the party opposing the waiver. In short, the court will look for a voluntary waiver of a known right by a person who understood what s/he was waiving; waiver will never be implied. So what provision will work? There are no guarantees. I have begun incorporating the following language in my rental agreements, but it has yet to be tested in court. Feel free to use the following provision, but recognize that some judges simply will not enforce such a provision, regardless of the language used in your rental agreement. To minimize delay and to reduce the cost of potential litigation, the parties hereby agree to waive their right to a trial by jury. The parties hereto understand that they are entitled to a jury trial for claims arising out of this rental agreement and/or the Arizona Residential Landlord and Tenant Act, but knowingly and voluntarily waive this right. I recommend that the foregoing provision be in bold type, in a type size as large or larger than the other portions of the rental agreement, and placed immediately above the signature line. You may even wish to have the tenant(s) initial this provision separately. (n) The rental agreement should address release of tenant property if the tenant dies. Notwithstanding Section 14-3911, the landlord may request and the tenant may provide and routinely update the name and contact information of a person who is authorized by the tenant to enter the tenant’s dwelling unit to retrieve and store the tenant’s property if the tenant dies. If the landlord is unable to contact the authorized person at the address and telephone number provided to the landlord by the tenant or the authorized person fails to respond to the landlord’s request within ten days of initial written contact, the landlord may dispose of the property as prescribed in Section 33-1370. Before removing any of the tenant’s personal property, the authorized person shall present to the landlord a valid government issued identification that confirms the identity of the authorized person. The authorized personal shall have twenty days from the date of initial written contact by the landlord or the last date for which rent is paid, whichever is longer, to remove items from the rental property and return keys to the landlord during regular business hours. If the landlord allows an authorized person to enter the property to remove the tenant’s personal possessions as prescribed by this subsection, the landlord has no further liability to the tenant, the tenant’s estate or the tenant’s hers for lost, damaged or stolen items. If the tenant’s personal property is not entirely removed from the rental unit by an authorized person, the landlord may dispose of the property as prescribed in Section 33-1370. This subsection shall only apply if the period rent is unpaid and outstanding for at least five days. In light of this new law, landlords should routinely collect the name, address and telephone number of a person authorized by the tenant to remove all of the tenant’s personal property in the event of the tenant’s death. Language should be added to the rental agreement, Tenant Application and/or the Tenant Information Sheet to accomplish this purpose. Although collecting this information is not required by the law, failure to collect this information prevents this new law from shielding the landlord from liability. Without this information, the landlord must hold the tenant’s personal property until someone appears with a court order (which will generally take quite some time) directing or allowing release of the deceased tenant’s personal property. (o) The rental agreement should include various miscellaneous provisions. A tenant becomes a “holdover tenant” when the tenant, without the landlord’s consent, continues to occupy the rental unit past the lease expiration date or after termination (by either the landlord or the tenant) of the rental agreement. If the tenant’s holdover is willful and not in good faith, then the landlord may recover damages against the tenant, which are generally equal to two months’ rent. But what about the rent for the period of time that the tenant occupies the property until s/he is finally evicted? In other words, what about rent during the holdover period? I routinely include a holdover provision in my rental agreements. It provides for “holdover rent.” This is the provision that I use. You may adjust it to suit your own circumstances. Holdover Rent. Rent shall automatically increase forty percent (40%) on all holdover periods, shall remain valid for the duration of the holdover period and shall be collectable as Rent. This provision shall not limit the Landlord's remedies provided by A.R.S. § 33-1375. Tenant shall indemnify Landlord for all damages and expenses incurred and shall reimburse Landlord for payment of all reasonable settlements made by Landlord with third-parties (i.e., other tenants) as a result of Tenant holding over. Failure to maintain utilities for any reason, whether voluntary or involuntary (i.e., failure to pay utility provider, resulting in turn-off of water, electricity or gas), shall be deemed a noncompliance materially affecting health and safety. The foregoing establishes the contractual right (i.e., in the rental agreement) for the landlord to evict the tenant for this type of breach by serving the tenant with a Five-Day Notice of Termination of the Rental Agreement for a Noncompliance Materially Affecting Health and Safety. Commercial vehicles, trailers and RV’s shall not be parked on or near the Premises. Tenants may not park more than one vehicle per Tenant (not occupants) on the Premises. Maintenance and/or repair of vehicles is not permitted on the Premises, except for minor repairs to vehicles belonging to Tenant or Occupants. As used in this Rental Agreement: minor repairs shall mean oil/filter changes, tune-up, changing a tire and washing of vehicles; vehicle shall mean vehicles of any and all types, including automobiles, trucks, motorcycles, mopeds, bicycles, etc. Tenant shall clean-up any mess (i.e., oil, grease, etc.) resulting from minor repairs. (a) The landlord cannot require the tenant to waive the tenant’s rights, agree to pay attorneys’ fees, or agree to limit the landlord’s liability. The Act expressly states that there are some provisions that landlords absolutely cannot include in the rental agreement. In short, the Act specifically prohibits provisions within the rental agreement whereby the tenant: (1) waives the rights or remedies granted to the tenant under the Act, (2) agrees to pay the landlord’s attorneys’ fees (with two exceptions), (3) agrees to limit the landlord’s liability, (4) agrees to waive or limit the tenant’s right to summon a peace officer or emergency assistance and (5) agrees to any type of penalty as a result of the tenant summoning a peace officer or emergency assistance. The exact text of the statute is reprinted below for clarity. 1. Agrees to waive or to forego rights or remedies under this chapter [Chapter 10, which is the Arizona Residential Landlord and Tenant Act]. 2. Agrees to pay the landlord's attorney fees, except an agreement in writing may provide that attorney fees may be awarded to the prevailing party in the event of court action and except that a prevailing party in a contested forcible detainer action is eligible to be awarded attorney fees pursuant to § 12-341.01 regardless of whether the rental agreement provides for such an award. 3. Agrees to the exculpation or limitation of any liability of the landlord arising under law or to indemnify the landlord for that liability or the costs connected therewith. 4. Agrees to waive or limit the tenant's right to summon or any other person’s right to summon a peace officer or other emergency assistance in response to an emergency. 5. Agrees to payment of monetary penalties or otherwise penalizes the tenant for the tenant summoning or for any other person summoning a peace officer or other emergency assistance in response to an emergency. B. A provision that is prohibited by subsection A of this section and that is included in a rental agreement is unenforceable. If a landlord deliberately uses a rental agreement containing provisions known by the landlord to be prohibited, the tenant may recover actual damages sustained by the tenant and not more than two months’ periodic rent. (b) The landlord cannot collect a security deposit equal to more than one and one-half month’s rent. A landlord shall not demand or receive security, however denominated, including, but not limited to, prepaid rent in an amount or value in excess of one and one-half month’s rent. A “reasonable” nonrefundable cleaning or redecorating charge (not deposit) is not a security deposit. Therefore, a landlord may require a security deposit less than or equal to, but not more than, one and one-half times the monthly rental amount, plus a “reasonable” nonrefundable cleaning, redecorating and/or other charge. For example, you rent a unit for $1,000.00 per month. You may collect a security deposit of $1,500.00 (which is exactly equal to one and one-half month’s rent) plus a “reasonable” nonrefundable cleaning or redecorating charge. But you cannot collect a security deposit of $1,500.00, a “reasonable” nonrefundable cleaning or redecorating charge, and a $1.00 key “deposit” because the $1.00 key deposit puts you over the one and one-half month’s limit. “Reasonable” is not defined by the statute. “Reasonable” is a somewhat subjective term, but be sure the amount you charge passes the “straight face” test. The “straight face” test is the maximum amount that you can charge and still look the judge in the eye and announce, with a straight face, in a room full of people (including other landlords), that the amount is reasonable. Naturally, in addition to the straight face test, the judge may also require you to explain and/or demonstrate how you arrived at that figure (i.e., he may insist on seeing some empirical data). As a general “rule of thumb,” and absent an extraordinary circumstances, you may be pushing the limits of what is “reasonable” if your cleaning or redecorating charge is more than one-half of the monthly rental amount. Don’t forget that if a cleaning, redecorating or other charge/fee is nonrefundable, it must be so stated in writing. Also, you must state in writing (i.e., in the rental agreement or elsewhere) the purpose of your nonrefundable fees and charges. See Chapter 2, Section E(6) (Disposition of Deposit Form); Chapter 5, Section B(7)(b) (Security deposit). (c) The landlord cannot include provisions contrary to the Act. The Act provides that the “lease agreement shall not contain any terms contrary to this section [wrongful failure to supply heat, air conditioning, cooling, water, hot water or essential services].” This language, that was added in 1995, means that the landlord cannot take away any of the rights granted by this section of the Act. The full text of this section appears below. 1. Procure reasonable amounts of hot water, running water, heat and essential services during the period of the landlord's noncompliance and deduct their actual reasonable cost from the rent. If the landlord has failed to provide any of the utility services specified in this section due to nonpayment of the landlord’s utility bill for the premises, and if there is no separate utility meter for each tenant in the premises such that the tenant could avoid a utility shut-off by arranging to have services transferred to the tenant’s name, the tenant may either individually or collectively with other tenants arrange with the utility company to pay the utility bill after written notice to the landlord of the tenant’s intent to do so. With the utility company’s approval the tenant or tenants may pay the landlord’s delinquent utility bill and deduct from any rent owed to the landlord the actual cost of the payment the tenant made to restore utility services. The tenant or tenants may continue to make such payments to the utility company until the landlord has provided adequate assurances to the tenant that the above utility services will be maintained. 2. Recover damages based upon the diminution in the fair rental value of the dwelling unit. 3. Procure reasonable substitute housing during the period of the landlord's noncompliance, in which case the tenant is excused from paying rent for the period of the landlord's noncompliance. In the event the periodic cost of such substitute housing exceeds the amount of the periodic rent, upon delivery by tenant of proof of payment for such substitute housing, tenant may recover from landlord such excess costs up to an amount not to exceed twenty-five percent of the periodic rent which has been excused pursuant to this paragraph. B. A landlord shall provide all utilities and services specified in the lease agreement. C. A landlord shall not terminate utility services as specified in subsection A of this section which are provided to the tenant as part of the rental agreement, except as necessary to make needed repairs or as provided in section 33-1368. Subsequent to the execution of the rental agreement, a landlord may not transfer the responsibility for payment of such utility services to the tenant without the tenant’s written consent. D. If a landlord is in violation of subsection C of this section, the tenant may recover damages, costs and reasonable attorneys fees and obtain injunctive relief. Nothing in this section shall preclude a tenant’s right to recover damages as specified in section 33-1367. E. A lease agreement shall not contain any terms contrary to this section. F. In addition to the remedy provided in paragraph 3 of subsection A of this section, in the event the landlord's noncompliance is deliberate, the tenant may recover the actual and reasonable cost or fair and reasonable value of the substitute housing not in excess of an amount equal to the periodic rent. G. If the tenant proceeds under this section, he may not proceed under section 33-1361 or section 33-1363 as to that breach, except as to damages which occur prior to the tenant proceeding under subsection A or B of this section. H. The rights under this section do not arise until the tenant has given notice to the landlord and such rights do not include the right to repair. Such rights do not arise if the condition was caused by the deliberate or negligent act or omission of the tenant, a member of the tenant’s family or other person on the premises with the tenant’s consent. The landlord and tenant may include in a rental agreement terms and conditions not prohibited by this chapter [Chapter 10, which is the Arizona Residential Landlord and Tenant Act] or any other rule of law including rent, term of the agreement and other provisions governing the rights and obligations of the parties. In summary, you cannot include a provision in your rental agreement that takes away rights given to tenants by Section 33-1364 or by the Act. [The foregoing was an excerpt from the Arizona Landlord’s Deskbook, 5th Edition; footnotes and citations of law were omitted]. This analysis of the act was useful to me as a Texas landlord. Thank you for the clear explanations and useful phrases. I am in your debt for the value you added to my own lease agreement. If you rent a house with a spa, and it is not working does the landlord have to fix it? Response by Carlton C. Casler: Excellent question. The "correct" answer depends on many variables. If it was not working when the tenant took tenancy and the landlord made clear that it would not be fixed, then the answer is clear -- the landlord would not have to fix it. If the spa was working when the tenant took tenancy, but it stopped working because of something the tenant, occupant or a guest did, then the tenant is responsible for repairs. (See ARS Sec. 33-1341). If the spa was working when the tenant took tenancy and the tenant is not responsible under Sec. 33-1341, then we must determine if the landlord's refusal to fix the spa constitutes a default, which is referred to in the Act as a “noncompliance.” The first place to look is in the rental agreement. If the rental agreement includes language that makes clear the landlord will not fix the spa, then (again) the answer is clear -- the landlord would not have to fix it. If the rental agreement says nothing about the spa, then we turn to the Arizona Residential Landlord and Tenant Act (the "Act"). Section 33-1361 of the Act allows the tenant to serve a notice on the landlord of the noncompliance and, if the landlord does not fix the problem, then the tenant may terminate and vacate or may sue for damages. The amount of time the tenant must give the landlord depends on the nature of the noncompliance. A “noncompliance materially affecting health and safety” is subject to a five day notice; absent unusual circumstances, a malfunctioning spa probably does not affect health and safety and probably constitutes (if anything) a “material noncompliance.” A “material noncompliance” is subject to a ten days notice. A “material noncompliance” also includes a “material falsification of the written information provided to the tenant.” (See ARS Sec. 33-1361(A)). If the tenant rented the subject property because (or at least partly because) of the spa (i.e., therapy for an injury or medical condition), then the landlord’s refusal to fix the spa would probably constitute a material noncompliance. In addition, if the landlord advertised the subject property (i.e., newspaper ad, yard sign, flier, Internet listing, etc.) and one of the features included in the advertisement was the spa, then the landlord’s refusal to fix the spa would probably constitute a material noncompliance. I say “probably” because two judges hear the same set of facts may reach different conclusion. There is yet another potential argument. Section 33-1363 gives the tenant a “self-help” remedy, allowing the tenant to pay a licensed contractor to make repairs and then deduct the cost of repairs (the Act provides for specific monetary limits) from the next month’s rent, but Section 33-1363 only applies if the inoperative spa constitutes a violation of Section 33-1324. A spa is probably not an “essential service,” does not affect health and safety and an inoperable spa does not render the subject property unfit or uninhabitable. (See Section 33-1324). Arguably, the spa constitutes “other facilities” supplied by the landlord (see Section 33-1324(A)(4)), but that is a tenuous argument, at best. Is there an Arizona law that states how often a landlord must paint and replace carpet? Especially when one tenant moves out before a new tenant moves in? Thank you. and keep the premises in a fit and habitable condition." (See ARS Sec. 33-1324(A)(2)). But the Act does not require the landlord to: (1) paint the walls, (2) replace or clean the carpet, (3) sanitize the kitchen or bathrooms or (4) change the locks, before renting to a new tenant. Naturally, the landlord may do all or some of those things, but the Act does not require it.